I compiled my first VST, and to no surprise it didn't work. It crashes all hosts upon loading, and Cubase blacklists it.... so I'm trying to break down the project until I find the issue. The first thing I'm noticing is an inconsistency with the output routing. I have a test project with 2 samplers in it. routing is listed below. It operates fine in HISE, but the compiled VST outputs both samplers to out 1-2. Try compiling the projects from the tutorial repository, they are supposed to work. i tried the multichannel example and work fine. if i'm right the first 2 images are sampler 1 and sampler 2 ? @staiff your above example is in the standalone version. That routing appears to work. I'm using the multichannel plugin version. @christoph-hart thanks for the info! Currently researching debugging. On another note, did you try the test I recreated on your rig? The thread 0x36e8 has exited with code 0 (0x0). The thread 0x3508 has exited with code 0 (0x0). The thread 0x32d4 has exited with code 0 (0x0). The thread 0x2c78 has exited with code 0 (0x0). The thread 0x1048 has exited with code 0 (0x0). And then the JUCE VST plugin host crashes. the pictures shown is inside the HISE standalone, yes. but compiled this as VST is the same thing. so tomorrow i will show you the result as VST. 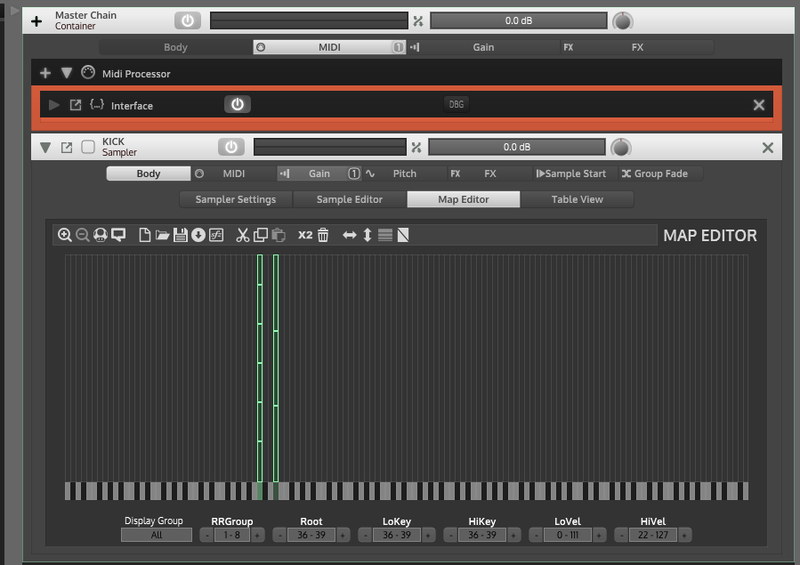 But maybe you will work with the standalone HISE, instead of vst one to create. VST one is for me for creating a player and load libraries in it. but maybe i'm wrong. see it tommorrow ( French time clock). tonight is for my family. Christoph example works. my project (and pictures above) works. it's just to help you. for finish: don't matter yellow lines in compiling. No matter. RED lines are another story. 100 % of time a wrong project/settings. try standalone HISE instead of VST; because first you don't have to open DAW or something else to work. Just HISE. Quicker, simplier. Never worked with other thing than standalone one. "On another note, did you try the test I recreated on your rig? In HISE it functions as expected. Once it's exported to VST, both samplers play out of 1-2"
what daw do you use ? but i prfer studio one (for multichannels) it's easy to know if it works or not. @staiff Thanks for checking it out. AFAIK the HISE plugin is the only multichannel version available. I can't create VSTi's that have multiple outputs on the standalone version. I'm using Cubase and Reaper over here. the pics i put above is made with standalone. so it's possible via standalone. Think it's possible to test it in reaper, but honesty i just use reaper to test the plugin because if reaper reject it, your plugin never works ! Reaper is powerful for that: a best tester for plugin stability. but for puting FX in bus, testing multichannel i really don't know how ... for me studio One is easier .... but because i use a lot S1 for composing. For info i actually working on a drum rompler (Simmons) with multi sampler (as seen on pics) separates kick, snare, hat, etc. ... and multi-out for each samplers. all in HISE SA. speedy compiled in VST 64 windows tonight and it works. the pics i put above is made with standalone. so it's possible via standalone. I think maybe there's miscommunication on the term "multichannel"? The standalone version doesn't allow more than 2 physical outputs from HISE in your main container. Am I not understanding that correctly? 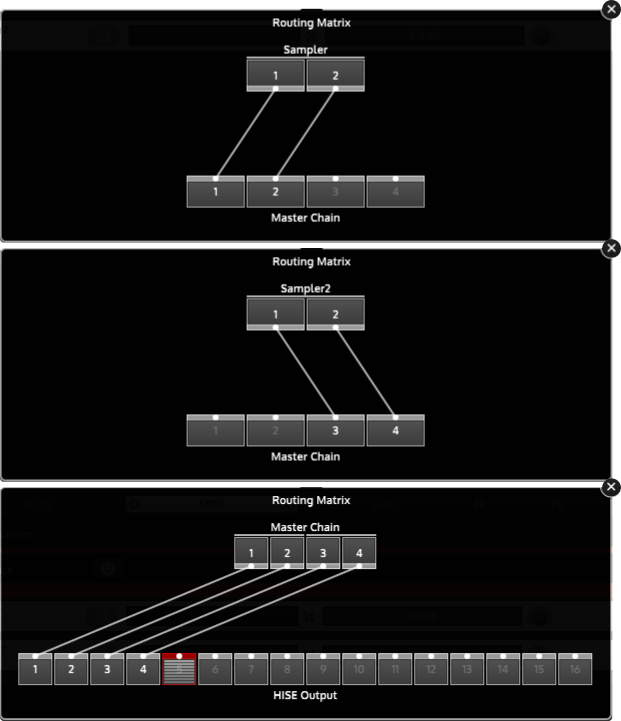 And HISE multichannel (only available in plugin format) allows up to 16 physical output in the main container. separates kick, snare, hat, etc. ... and multi-out for each samplers. I think that's the difference. I'm not using multiple outputs from each sampler, I'm using physical outputs from HISE. @Christoph-Hart I think I got it. I can't have more than 1 midi note occupied with RR samples in a single sampler. The second that I have 2 RR instruments in the same sampler, I get a crash. That is weird. Can you send me the patch and the samples so I can try to reproduce it? unfortunately, It's not the only cure... still having issues which might be container related. HISE Standalone (and maybe VST, i don't know, i'm not using it) has only 2 ouputs (1+2) ! So when i create multi out project in Hise, of course i only have a single stereo output ! i must compile it (as VST or Standalone or else) for testing the multi-out. during the Hise process you can't really test it. But as i know the Christoph's code/example works well i create without doubt in HISE. after that when compiling it and test it as WIN VSTi 64bits and put it in Studio One plugin = i have multi output ! That's why Christoph put in the example the "ok, error" part of code = just to show you that when you don't have multi outputs (like in HISE) = it says "error" and put all multi out in the single 1+2 (stereo main) outputs ! alaways need a video tuto now ? @Christoph-Hart After testing, it appears random what compiles properly and what doesn't. The only consistent thing is compiling any project containing more than one sampler is like rolling the dice. I should also add that this is for compiling VST. Sandalone works properly. @Christoph-Hart I've been tinkering with this all morning. I can isolate the problem 100% to the audio files. I compiled a VST of my project, moved it to another computer (without the samples) and it loaded fine! The second that I locate the sample folder in the plug, it crashes all hosts. if I remove the sample folder, it opens fine again. I've gone thru each of the sample audio files, and I can't find anything wrong with them.